The Brother DCP-L2540DW Compact Laser Printer packs full copying and printing functionality into a compact design that's ideal for small businesses. Featuring an integrated printer, scanner, and a host of versatile networking options, the Brother DCP-L2540DW Wireless Compact Laser Multifunction Copier handles the demands of any small business. This copier has a compact footprint that can easily fiton top of a desk, making it ideal for use in homes or small offices. It also lets you print from any WiFi-enabled computer or mobile device with its built-in Wi-Fi receiver. 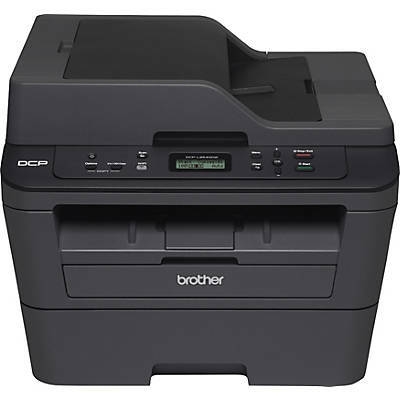 Equipped with a comprehensive range of connectivity options, the Brother DCP-L2540DW Wireless Compact Laser Multifunction Copier makes it easy to print from nearly any device. It features a Wireless 802.11b/g/n receiver that lets you connect any compatible device wirelessly, plus an Ethernet controller for wired connections to your home or office network. Using the Brother iPrint&Scan app (downloaded separately to your mobile device), you can also assign print and scanning jobs remotely from your smartphone or tablet. With resolutions up to 2400 x 600 dpi, the Brother DCP-L2540DW Wireless Compact Laser Printer ensures a tidy, professional look every time you print or copy. It can print and copy at rates of up to 30 ppm, minimizing the time you spend waiting for a job to finish. The Brother DCP-8155DN Compact Laser Multifunction Printer helps you cut down on paper consumption by up to 50 percent with its automatic duplex (two-sided) printing feature. It also allows for fast, two-sided copies and scans, even if the original document is one-sided. And with its convenient auto-document feeder, the printer lets you copy large documents up to 50 pages in length without requiring you to manually insert each page. Brother DCP-L2540DW Wireless Compact Laser Multifunction Copier, starter toner cartridge (700 pages), DR630 drum unit (12,000 pages), quick setup and basic user's guide, installation CD-ROM, and AC power cord.